“If you can arrange a mud hut in which I can stay, I’ll go to Uganda,” was the email I sent to Rev. Robert Johnson, my former pastor. Robert emailed me back that he had arranged it and jokingly said the owner’s wife would probably even let me milk their cow. 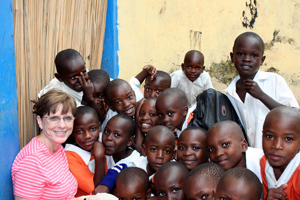 I have traveled extensively in various parts of the world, but that email was the beginning of a trip that would not only change my life, but the lives of many people here and in Uganda. 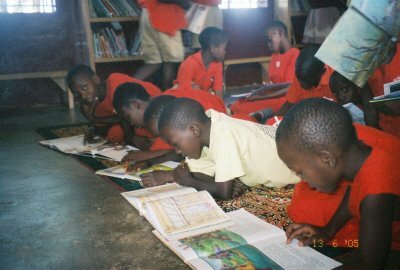 My goal as I prepared to go in 2001 was to stay in Ugandan homes, since I wanted to truly experience the African culture. Three Ugandans who were living in Austin very generously arranged places for me to stay and visit in Kampala, the capital city. The kindness of the families I spent time with, as well as many other Ugandans, still touches my heart. When people who have very little are generous and welcome you into their homes, it changes your outlook on life. 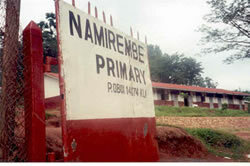 While in Kampala, I visited Namirembe Primary School. 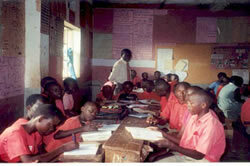 A family I spent quite some time with had children who attended this school. The students and staff were delightful. I enjoyed visiting in many classrooms, as well as with the teachers and administrators. As I visited with students, many asked if I could possibly send them books from America. Those words would run through my mind many times in the next few years. After leaving Kampala, I traveled to Mbale, to spend a week with Pastor Wilberforce Okumu, his wife, Sarah, and their children – Billy Paul, Mitch, and Mercy. While in Mbale, I contracted malaria. Soon I traveled back to Kampala. I made an appointment with a doctor who thought it was a cold, as I had been taking pills to prevent malaria. However, I continued to get sicker. Finally, one night I was terribly ill and lay doubled over in a dirt courtyard. I knew I needed to get help quickly. It occurred to me that I had the phone number of some American missionaries, Herb and Ellen Cook. I phoned and told Herb I was extremely sick …that it was an emergency. He graciously replied that it didn’t have to be an emergency, he would be glad to come for me and I could stay with them. As we arrived at the Cooks’ home, Ellen greeted me with open arms. I am so grateful that God provided these “angels,” as my life truly depended on it. The next day, I visited a Chinese doctor that had an office close to the Cooks. He drew blood and shortly announced I had a severe case of malaria. In fact, he said in two days the malaria would have won, which was a rather sobering thought. After I returned to the States, I spent much time reflecting on why my life was spared and what God’s will was for my life. I continued traveling to other countries, but Uganda remained constantly with me. I was hardly able to speak of my time there without tears in my eyes. The many other countries I have visited are wonderful places, but Uganda was an experience that deeply affected my heart.